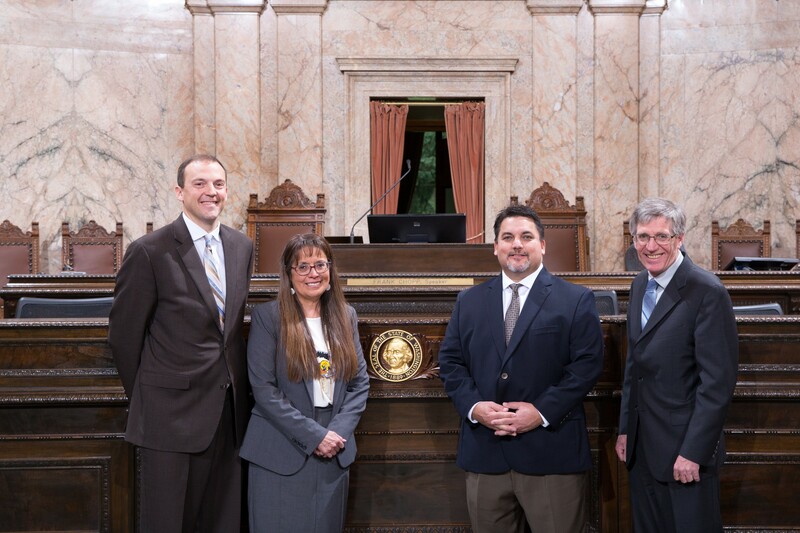 FROM LEFT: Washington state Rep. Marcus Riccelli and Spokane Tribe Chair Carol Evans, Spokane Tribe board member Tiger Peone and Rep. Timm Ormsby pose for a photo in Olympia. Almost four years ago, Rudy Peone — then chairman of the Spokane Tribe — sent a letter to the Spokane Regional Transportation Council (SRTC) with a simple request: They wanted in. "As a tribal jurisdiction with the deepest ties to metropolitan Spokane, we have a vested ancestral interest to help influence the region's future," Peone says. After all, the SRTC plays a major role in shaping the direction of the region. Before federal transportation funds are dispersed in Spokane County, it's the SRTC that shapes how those funds would be spent. The Spokane Tribe even has its own transit agency, the Moccasin Express, which provides direct bus rides to the city of Spokane. And yet, while voting members on the SRTC include those representing Spokane County, Liberty Lake, Cheney, Airway Heights, Spokane Valley, the Spokane International Airport, (representing small towns), freight and rail big businesses, the Department of Transportation, and a representative for small towns like Deer Park, local tribes aren't on the board. Sure, the Tribe was able to vote as part of one of the SRTC's committee, Peone wrote, but there were so many members of that committee — 22 — that "Spokane tribal opinions are diluted to the point of insignificance." They wanted full voting membership. Three years later — in 2018 — the Spokane Tribe wrote another letter, again reinstating their request: "After all, it is the Spokane Tribe that puts the 'S' in SRTC," wrote Carol Evans, the current chair of the Spokane Tribe. It's finally 2019. And the chair of the SRTC board of directors, Spokane County Commissioner Al French, is asking the Tribe to wait just one more year. In 2020, new census population numbers come down. That's when SRTC will use those new numbers to do a wholesale examination of all its Interlocal Agreements, including representation on the board. That, French argues, is when they can talk about the Spokane or Kalispel tribes joining. But the Spokane Tribe is sick of waiting. "Al’s playing games. He’s intentionally dragging his feet," Spokane Tribe executive director Mike Tedesco says. "If he thinks tribes are not a part of the region and should not be included in decision making, we disagree with that perspective." So now, Washington state Rep. Marcus Riccelli has introduced a bill in the state Legislature that throws down the gauntlet. If his bill passes, the SRTC would have to give the local tribes a "reasonable opportunity for voting membership." If they don't, it would lose state funding. French's argument, at least at first, is primarily one of efficiency: He says it doesn't make sense to debate tribal representation on the SRTC throughout 2019 and then open up negotiations all over again to debate the board representation in 2020. Why renegotiate the same Interlocal Agreement twice? "The last time we negotiated the Interlocal Agreement to create the composition of the board as it currently sits, it took almost a year," French says. "That’s why we said, when we’ve got the data to make good sound decisions, that’s the time to do this. That’s what my recommendation to the board has been." But that idea — that the issues involved are tricky to untangle — is exactly why Tedesco says it makes so much sense to start the process immediately. "There’s no reason why the conversation can’t formally open right now," Tedesco says. "When the census numbers do come out, we're poised to approve the governing document. It will be a complicated and long conversation to get to the point where there’s 100 percent consensus." And to the bill's sponsor, Rep. Riccelli, there's an even more persuasive aspect to consider. "Here’s what I would say is a deeper philosophical thing to consider: It goes back to, historically, how are we treating our recognized tribes in a government-to-government relationship?" Riccelli says. "Right now, Commissioner French seems to be saying, 'We get to decide who’s at the table.'" Yet, for French, the answer isn't as obvious as it seems to Riccelli. There are a number of tricky issues to consider. "We’ve got multiple tribes that have interests in the county," French says. "Do you have one member representing all the tribes or one member representing each tribe? Right now, the council is made up of jurisdictions that are peers. And now you bring in a sovereign nation? How does that change the makeup of the decision process?" As Riccelli notes, of the 11 regional transportation planning organizations in the state that have tribes within their reservation area, only three — including the SRTC — haven't invited tribes to be voting members of their board. The Northeast Washington Regional Transportation Planning Organization includes tribal representation for the Colville, Kalispel and Spokane tribes. The Peninsula Regional Transportation Planning Organization, in the northwestern Olympic peninsula part of the state, includes the Hoh River, Jamestown S'Klallam, Lower Elwha Klallam, Makah, Port Gamble S'Klallam, Quileute, Squaxin Island, Skokomish and Suquamish tribes. "It seemed like everyone else recognized the importance of inclusionary efforts," Riccelli says. Yet, as the Spokane Tribe pointed out with their first letter, if you bring in too many voting members on the board, you dilute the influence of each member. That's one reason why the population has been a crucial factor in how many board members are on the council. "We have cities in the county that have populations much greater than the tribe that don’t have representation on the council either," French says. French notes Riccelli doesn't actually have any tribal land in the 3rd Legislative District he represents. "I’m not sure what the motivation of this bill is," French says. "It places transportation funding at risk for people who rely on public transportation, for the sake of a tribe that has no land in the 3rd Legislative District and only represents about 2,800 in the country." But Tedesco dismisses this argument. "That’s a classic blunder and a narrow and ignorant perspective of what tribes bring to the table," Tedesco says. "There are billion-dollar neighbors on the West Plains that are being ignored based on nothing more than Al's lack of perspective. ... The whole dynamic is absolute baloney. It’s built on faulty premises meant to protect the turf of people like Al." "It sounds like what Marcus wants to do, he wants to run the board instead of having the jurisdictions run it," French says. If you noticed an undercurrent of hostility in this debate, it's illuminating to note that the conflicts between French, Riccelli and the Spokane Tribe have extended far beyond simply the SRTC. "I’m pleased that Commissioner French, who is suing the state right now over something that will increase representation, is excited about the discussion about adequate representation," Riccelli quips. Riccelli's referring to a bill he passed last session that would increase the number of county commissioners from three to five and elect them by district instead of county-wide. French and the other commissioners voted to sue the state over the bill. French argued the bill was unconstitutional and contradicted the will of the voters. Others, however, saw political motivations: Five commissioners could not only weaken French's influence over the commission; French might also be more politically vulnerable if voters elected commissioners by district, depending on how the lines get drawn. And as for French and the Spokane Tribe? French fought tooth and nail against the construction of the Spokane Tribe Casino, arguing that its location could imperil the future of Fairchild Air Force base, despite the Air Force insisting that its concerns had been addressed. The casino has since been built, but the County Commissioners sued to stop it. "That tension is still there," Tedesco says. "That disappointment in Al French is still there. He is still spending taxpayer money to sue the federal government to close the Spokane Tribal Casino." But Riccelli, at least, hasn't given up hope that French will come around on this issue. He didn't talk to French before introducing his bill. That's an oversight Riccelli plans to remedy. "A call to Al French is something on my list," Riccelli says.